Adding THE VOICE to a night always livens things up. NBC: A special Thursday episode of THE VOICE was the highest-rated show of the night at 2.3, down 0.3 from Tuesday’s installment. That big lead-in pushed CHICAGO MED up half a point from its last airing to 1.7, and even THE BLACKLIST: REDEMPTION gained 0.2 to 1.0. ABC: The 3rd chapter of WHEN WE RISE was down another 0.1 from Wednesday to a woeful 0.5, the same as the PEOPLE BEHIND THE STORY documentary hour that preceded it. FOX: After MASTERCHEF JR dropped 0.1 to 1.1, the season finale of MY KITCHEN RULES rose 0.1 to 0.8. 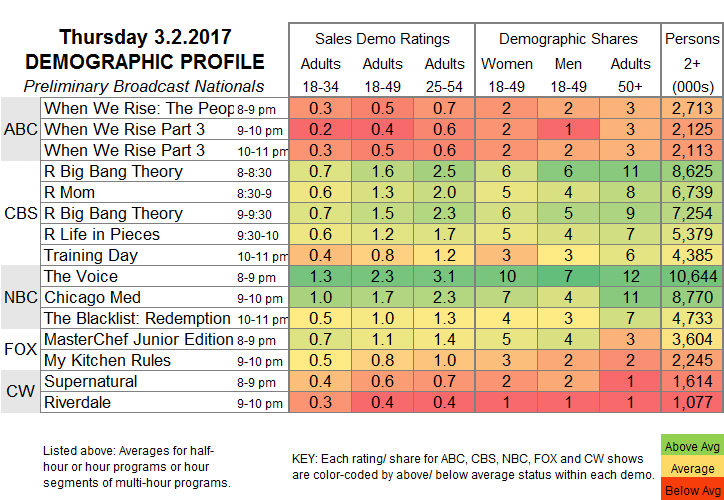 CW: SUPERNATURAL held at 0.6, and RIVERDALE was up 0.1 to 0.4. 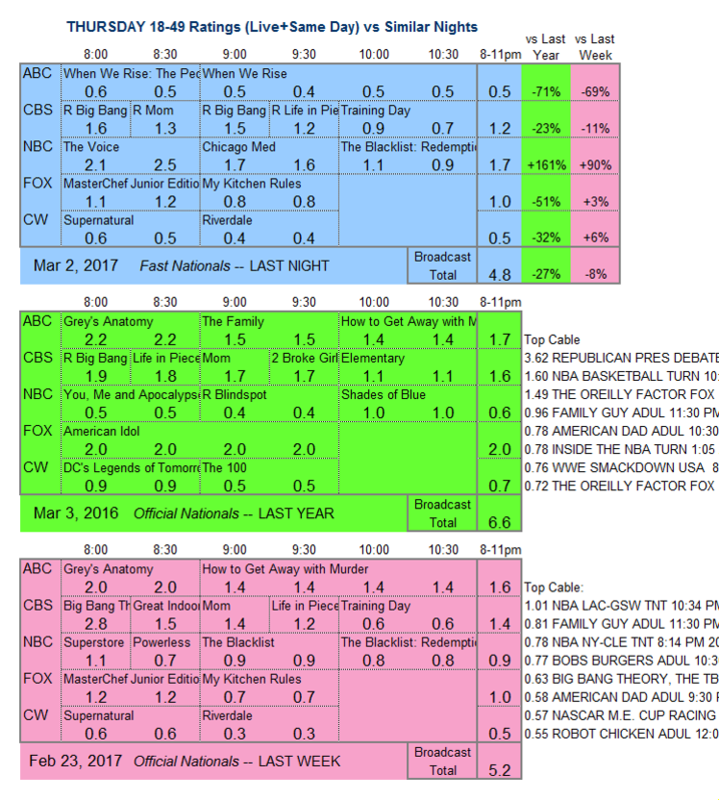 CBS: The night started with a quartet of sitcom reruns, featuring two BIG BANG THEORY episodes at 1.6/1.5. Then TRAINING DAY (the first episode to air since the death of star Bill Paxton) was up 0.2 to 0.8. ABC has one more episode of WHEN WE RISE to endure tonight. In other low-rated news, NBC airs the season (and presumable series) finale of EMERALD CITY.